2018. 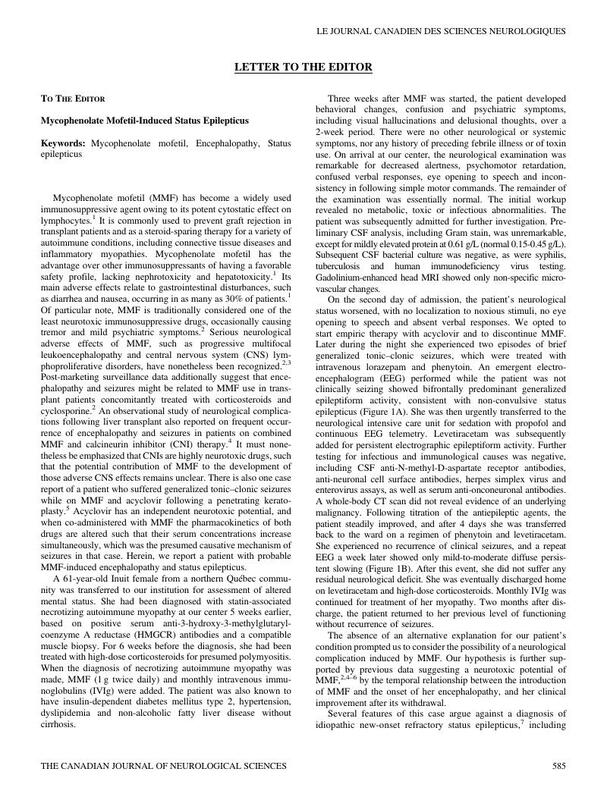 Mycophenolate mofetil. Reactions Weekly, Vol. 1731, Issue. 1, p. 192. COPYRIGHT: © 2018 The Canadian Journal of Neurological Sciences Inc.
1. Shipkova, M, Armstrong, VW, Oellerich, M, Wieland, E. Mycophenolate mofetil in organ transplantation: focus on metabolism, safety and tolerability. Expert Opin Drug Metab Toxicol. 2005;1(3):505-526. 2. CellCept, mycophenolate mofetil. Product monograph. Mississauga, Ontario, Canada: Hoffman-La Roche Ltd; 2017, www.rochecanada.com. Accessed February 4, 2018. 3. O'Neill, BP, Vernino, S, Dogan, A, Giannini, C. EBV-associated lymphoproliferative disorder of CNS associated with the use of mycophenolate mofetil. Neuro Oncol. 2007;9(3):364-369. 4. Derle, E, Kibaroglu, S, Ocal, R, et al. Neurologic complications after liver transplant: experience at a single center. Exp Clin Transplant. 2015;13(Suppl 1):327-330. 5. Lee, KM, Kim, MK, Wee, WR, Lee, JH. Tonic–clonic seizure following combined treatment of mycophenolate mofetil and acyclovir. Graefes Arch Clin Exp Ophthalmol. 2011;249(7):1107-1108. 6. Nasr, DM, Hocker, S, Wijdicks, EFM. Organ transplant recipients and critical care seizures. In: Varelas PN, Claasen J, editors. Seizures in Crticial Care Current Clinical Neurology, 3rd ed. New York: Springer International; 2017:259-268. 7. Costello, DJ, Kilbride, RD, Cole, AJ Cryptogenic new onset refractory status epilepticus (NORSE) in adults-infectious or not? J Neurol Sci. 2009;277(1–2):26-31. 8. Rodrigues-Diez, R, Gonzalez-Guerrero, C, Ocana-Salceda, C, et al. Calcineurin inhibitors cyclosporine A and tacrolimus induce vascular inflammation and endothelial activation through TLR4 signaling. Sci Rep. 2016;6:27915. 9. Beniczky, S, Hirsch, LJ, Kaplan, PW, et al. Unified EEG terminology and criteria for nonconvulsive status epilepticus. Epilepsia. 2013;54(Suppl 6):28-29.